Theresa May might have claimed “austerity is over”, but as expected the Autumn Budget fell far short of that promise. 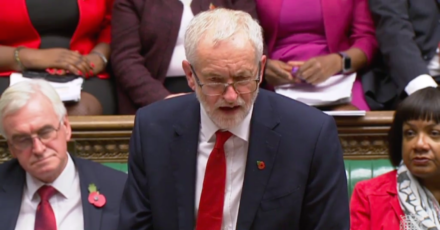 “This is a broken promise budget,” Jeremy Corbyn said, pointing out: “Far from building a strong economy, eight years of austerity has damaged our economy, delayed and weakened the recovery and endlessly postponed fixing the deficit.” All that pain, and what has it been good for? Although the Tories have pretended to cheer the economic growth forecast, which has been revised slightly upwards, it still stands at just 1.6%. That’s a “lower medium-term growth rate than almost all forecasts made since 1985”, according to the IFS. And yet the priority for this government is to raise income tax personal allowance from £11,850 to £12,500, further increasing the number of adults in the UK who pay no income tax at all (currently 40%), and up the higher rate income tax threshold from £46,350 to £50,000. That’s an extra £1,700 a year for couples jointly earning over £50,000. With an eye on middle-class voters and no regard for genuine alleviation of suffering, this is where the Chancellor chose to spend his cash. As Corbyn described the impact austerity has had on the poorest, most disadvantaged and marginalised people in the country, Tory MPs either joyfully heckled or simply looked bored. Labour set out ten emergency demands for the budget that would tackle the worst effects of Universal Credit. This afternoon, Philip Hammond confessed there were “genuine concerns about two issues”: the “implementation” of the flagship Tory benefits policy and its “rates and allowances”. Just small details, then. In response, he offered £1bn over five years to help with the transition, and increased work allowances by £1,000 per annum (at a cost of £1.7bn annually). Better than a poke in the eye, but not nearing the level of change required to make the roll-out work. The cuts remain “hardwired”, using Corbyn’s term, into the design of the system. Significantly, Hammond told the chamber he had never signed off a PFI contract (the words “as Chancellor” were important here) and would abolish all use of PFI and PF2 for future projects. While strangely accusing John McDonnell of neglecting to recognise that nearly 90% of those contracts were agreed by the last Labour government, when of course the Shadow Chancellor would likely be more than happy to highlight such a fact, this policy sees the Conservative government shift to adopt a position held, of course, by Corbyn’s Labour Party. Shadow health minister Justin Madders did, however, remark that Hammond “forgets to mention that NHS Trusts now pay the government more in loan repayments than they do in PFI debt”. Corbyn called today’s government spending announcements a “drop in the ocean”, and justifiably so. Many pledges amounted to £200m, £400m – small commitments and revenues in the grand scheme of budget things. The Chancellor basically admitted as much when he threw a bone to education: a £400m “one-off” payment to schools for “little extras”. The Tories are making some attempt to park their tanks on Labour’s lawn, with a ‘Google tax’ (raising just £440m) and no more PFI, but the public can feel austerity and will see through the rhetoric. As the Labour leader concluded, the government is still doling out “half-measures and quick fixes while austerity grinds on”.